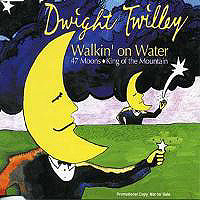 Recording at his Big Oak studio in Tulsa, pop legend Dwight Twilley released 47 Moons late in 2004 on his new label home, DMI (Digital Musicworks International). For his first album album of new material since his 2001 album The Luck, Twilley reunites with long time guitarist Bill Pitcock IV, adding After the release of The Luck, we spent a lot of time building and equipping our own recording studio. The hard work was worth it. With my wife Jan engineering and my good friends Bill Pitcock IV and Jerry Naifeh only a phone call away, I had never felt so self contained and in control of my art. Going back to his mid 70s albums on Shelter and his early 80s releases on EMI, Twilley was often regarded as one of the most gifted pop songwriters of a generation and he fulfills his musical destiny in 2004 with 47 Moons. For sheer pop pleasure, it just doesnt get any better than 47 Moons. 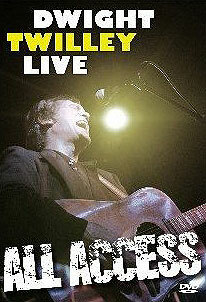 Dwight Twilley spoke with Robert Silverstein on February 14, 2005 about the new CD. MWE3: Dwight! Its Robert from 20th Century Guitar magazine and mwe3.com. DT: Hey Robert, how you been? MWE3: Congratulations on 47 Moons. Youve said the planets aligned for you regarding making this album. What about DMI did you like as a label and how did it finally come together regarding making the new CD? DT: They approached us. Kind of from out of the blue, contacted us. It was pretty much, I think, around this time last year. We were very interested in their whole content towards marketing and their whole vision of the digital world. And especially since, things like...I mean its kind of obvious that the major labels have been floundering for some time. Radio became so formatted and niched. Their whole idea toward promoting music really appealed to us. And we just got to meet them, all the people at the company, and really liked the people involved. It seemed like they were putting together a really good team and it just almost seemed like perfect little match for us. MWE3: So 47 Moons is your first album of new music since Tulsa? DT: Yeah, it really is. We were kind of threatened by Tulsa in a way. 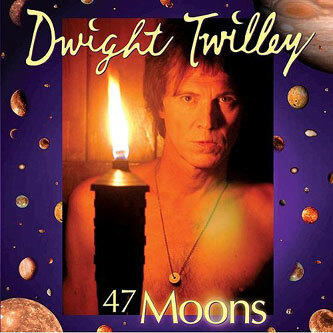 Sonically, its nowhere near 47 Moons, I dont believe. But as far as the material, just the song lines, it was kind of a challenge to us. We felt anyway like it was kind of hard to live up to the collection of material but once we got five or six songs in we felt pretty confident. MWE3: Could you say something about the studio and how 47 Moons was recorded? DT: A lot of people that went Pro-tools over the last few years, you know they rushed out and got all the equipment and seemed to almost brag about the fact that they could record in their living rooms. That was never our concept. We spent a lot of time putting together our room. We built it from the ground up. And so it took us a little longer (laughter) than other people but as end result what we have is our little magical laboratory. And were very safe and comfortable out there. In fact, since the record has been finished, you know were nervous about going out in the world (laughter) cause we feel so safe in our magic box. And like a lot of people, we just walked into the world of pro-tools and when we began, once we had our room the way we liked it and we started organizing the equipment we sat in front of the pro-tools unit for about three days and waited for it to make a noise (laughter), literally. I think it was about three days in and we finally heard this little (ch sound)... Its alive! (laughter) And then there were the people that said this was a whole new technology you need to learn and stuff. And of course, there was no concept of that. We just immediately began recording. MWE3: Have the advances in technology made recording easier for you? DT: For someone like me, yes. I was in the crowd of people that went kicking and fighting with analog and the reel to reel machines. Cause I know so many of the tricks. Id done it for so long that I just couldnt imagine that I could actually...that there wouldnt really be a board, there would be a screen. That there would actually be no tape. But now I would never go back. Someone like me, with the amount of number of vocals that I do and layering of guitars and things like that, its not just easier, it really opens up a lot of doors so you can do things faster to find out if youre getting the right result. And theres just a lot of things you just couldnt do before, so the few tricks that you used to be able to do with tape that you have to give up, you win back two or three more in their place. So, its very nice. And on this record too, since its our own little world no one can tell us to stop recording or when to record...of course were very addicted by it. MWE3: You can record at five in the morning! DT: Absolutely. Im sure you see in the credits that my wife engineered it. MWE3: You and Bill Pitcock make a potent guitar team on the new album. He really nails it. DT: Absolutely. He always does. (laughter) I really just used two guitars. For electric I use a Fender G&L Asat. And then my acoustic that Ive been using since 1977 is a Gibson J-160E custom. Thats really been my workhorse throughout the years. It looks pretty terrible but it sounds awfully good! (laughter) Its got the battle scars. DT: Oh, total. Finally, actually, since Im starting to think about doing shows. And finally this year I finally decided its time to retire the Gibson because I just cant take the chance of taking it out on the road having it get lost or stolen or damaged. Its just one of those guitars, you can leave it alone for a month and you pull it out of the case and its totally in tune. 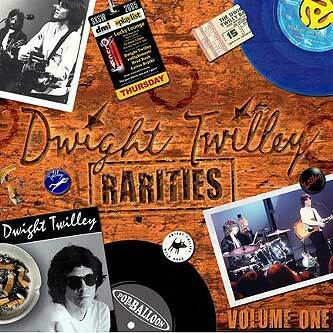 MWE3: How about a Dwight Twilley signature model? DT: (laughter) There was one actually made. Back in 79, I think. 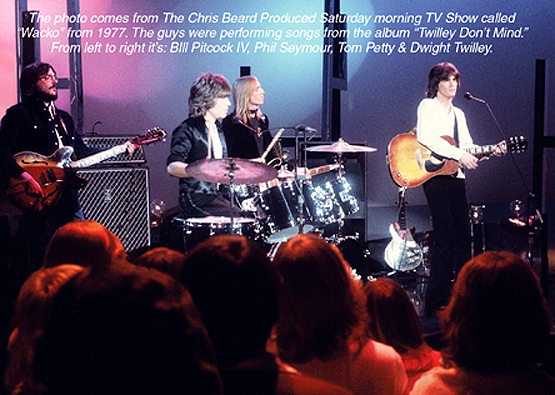 Somebody made a custom Dwight Twilley guitar and it was the first wireless, cordless guitar. And it was funny, because Im like a songwriter, get-the-feel kind of guy. This thing was more designed for somebody like Pitcock. It looked like a Japanese coffee table. It had like nine hundred different kinds of pickups and every feature that you could imagine. It was just a beautiful guitar. They were just getting ready to do the deal on it. I had the prototype I guess. The funny thing was, the people that built it...there was something wrong with the wireless system in it, I forget what it was, so we sent it back to the person who built the guitar and his shop was burglarized and it was stolen. So somewhere out there in the world theres a Twilley signature model guitar. It even had my logo. Twilley, the star in gold. MWE3: How about Bills guitars? MWE3: I want to ask you later about the song classic Chance Of A Lifetime but for the most part, when was the music on 47 Moons written? DT: Most of the stuff is new. When I do any record its the same thing. Ive got so many songs. I have quite a little catalog of songs and its always real important to me, as we were discussing, like living up to the song quality of Tulsa. I dont like to make an album that sounds like the same song over and over again, different versions of the same song. So a lot of times what Ill do is, after I write two or three brand new songs in a row Ill go back into my treasure chest and look for things that I wrote five, ten years ago, or longer, and update them. And they seem to have a freshness. Its almost like somebody else wrote them. Or I practically forgot about them. Sometimes people suggest songs. They go, hey man, remember this? That song in particular, I submitted for a film and had a female vocalist singing it with different lyrics. MWE3: Youre talking Chance Of A Lifetime? DT: Uh-huh. And while I was doing that, well it kind of struck everybody was just, man, thats a good song. It would be kind of nice if I did that. Cause it was a little hit in Europe for a girl named Marti Jones. MWE3: One of the great singers of the 80s. That song was on her Match Game album. You wrote that song. I remember Marti did a great job on her version back in 1986 or so. DT: The truth is, back when I wrote that song, I demo-d it, I had Susan Cowsill sing it. She had a much more uptempo...or our version was much more uptempo and rockin than the one that Marti Jones did. I like Marti Jones version, but there was still kind of like unfinished business there. (laughter) So when we were recording this little demo for this film...I really wasnt sure, cause it was written with the female aspect and for a female voice, so it was a little bit demanding vocally. (laughter) So I wasnt quite sure if I could pull it off, but I got lucky. MWE3: The album takes no prisoners and starts off with, Better Watch Out with some pretty charged up lyrics. Was there anything political about that one? DT: No, it was really more the case of, for me, when I get into making a record, its a lot of times that the record starts demanding what you do. You get two or three songs going and suddenly you notice that theres something missing and in the midst of the things that I was doing, some of the first things that I started out with, like the title track, just kind of in that one little area, one kind of little thought pattern. And Better Watch Out was kind of the result of listening to six or seven of the tracks nearing completion and going, you know what? We need something here thats sinister, upbeat and sexual. And really the origin of that song was something that the album itself demanded from me. MWE3: The title song 47 Moons is a masterpiece of Beatles style symphonic pop. DT: (laughter) We knew it was a special song. When we first cut it in a rough form several people came over and, without us really paying much attention to it...wed just be playing and playing back and someone would walk in the room and there were several people that were moved to tears. And the interesting thing was that we kind of discovered that people interpreted the song in so many different ways that I would now kind of stand back and be real hesitant to even point out where I was coming from with the song because it might interfere with other peoples fantasies. MWE3: The song is very lyrical so I was surprised to find the album had no lyric sheet. DT: We had lyrics. I think it was just a record company decision. Was there really room for it, cause they would be so small. CDs are so small these days. There are quite a bit of lyrics on this album so I think it was just a matter of logistics. Hopefully theyre clear enough so theyre easily understood. MWE3: On the albums single, Walkin On Water, its clear the guitar parts you and Bill play on the album were very much structured like George Harrison would do in The Beatles. DT: Thats just the sound I grew up with. I grew up waiting at the record store for the new Beatles album to show up. I just took a little left turn in my early teens when I had the opportunity to spend some time in Tupelo, Mississippi with Ray Harris, who was an early Sun artist. I was raised with The Beatles but ended up being, at a later date, influenced by Elvis at the same time. Part of it (was) taking the time that we were able to take. Cause it was kind of like our baby. We were making a special record for us. As far as guitars are concerned, like for instance, on 47 Moons, the acoustics your hear are eight tracks of acoustics. Two tracks close mic with the 58 and then I did two tracks about ten feet away from the microphone. Then I did two tracks where I just played the acoustic with my hands, without a pick, just lightly brushing it. Then I did another two tracks probably like ten feet away from a vocal mic with echo on it, and then mixed all eight tracks together down to two. So its that kind of thing that you can do, when youve got your own laboratory, youve got the luxury. You dont necessarily want to spend that time if youre on somebody elses clock, like with the big labels and the big studio, with the big producer...(laughter) But in our little world, we have the luxury to do things like that on every level. And a lot of the guitars that are Bill are actually up to twelve tracks. Wed go through and then edit them down. DT: Absolutely. Also if you consider the fact that Im singing all the vocals. MWE3: So how many vocal tracks would you say are on the song 47 Moons? DT: Oh, for the love of God...(laughter) I dont know where to begin! I know that when we did Chance Of A Lifetime, that somebody calculated there were twenty four tracks of vocals. On a whole record, we used to work on a twenty four track machine! That would literally be every track on the machine. MWE3: Runaway With You is another killer song with a great late period Beatles type vibe. DT: Thats actually my favorite track on the record. To me, its just a great fantasy, to literally run away. Especially in todays world, talk about political. The line is, I just want to close my eyes and drive. (laughter) I think all of us would kind of like to close our eyes and drive sometimes. Turn off CNN and close your eyes and drive. Some of the fans have picked up on fact that I use a little snippet of a song from the album Twilley Dont Mind, Trying To Find My Baby, in that song, which is another drive your car type song. If you listen in the instrumental it hints back at the riff of that song from Twilley Dont Mind. MWE3: Although Ice Captain is still maybe my favorite song on the album. I remember playing it a lot during the blizzard we had here in NYC last month. DT: (laughter) Well, that was definitely the engineers favorite. MWE3: Another Beatle-esque moment on 47 Moons. DT: Right. The thing is, Ive been writing songs for quite a while and it comes really easy for me. The thing thats the challenge is the idea behind the song. Im constantly like looking...just like when I was listening on late night, to one of those talk shows where they talk about UFOs and Zombies. Some scientist just blurted out that Jupiter has forty seven moons, so I just thought immediately, now thats a song title. There was an occasion when my wife was getting ready to take a nap. And she was getting in bed and we were just having a chitchat conversation and she just asked me could I close the blinds cause she didnt want someone to see her naked in the window. So I stopped in my tracks and said, naked in the window. (laughter) She knows when I say that, that means its a song title. Thats a perfect fantasy. Ive never seen anybody naked in the window but I know its a great fantasy. We went on to talk about needing to get dog food or something, pay some bill or do something, and a few minutes later she mentioned that one of our friends, Jackie had called. And I just thought to myself, Jackie, naked in the window, its perfect. MWE3: Could you say something about your early musical influences? What came first guitars or keyboards and can you remember your first guitar? DT: Brian Wilson too and a lot of people. Definitely Elvis and The Beatles were my main driving force. We were the kind of guys that, like a lot of people that do this kind of music, thought that The Beatles invented rock and roll and Elvis was a guy in movies. I think the thing that set myself and the Dwight Twilley Band apart from other people that just followed like soldiers behind everything that The Beatles did is that we just kind of got that added last minute influence from the earlier, other side of rock and roll. And thats partially what ingrained in the importance of echo with it. MWE3: What The Beatles did you mean? MWE3: Can you remember your first guitar? DT: Absolutely. (laughter) It was a Stella! The guitar you could get at Sears for like twenty nine dollars. And it was my little brothers. I found it abandoned in the closet. Hed lost interest in it so I yanked it out of the closet and I thought itd be a cool thing to play Beatles songs. Then I discovered that I couldnt play Beatles songs (laughter) cause I didnt know enough chords. And so the obvious next step was to write my own songs, so I could play em. I was about fifteen at the time and that was the beginning of my song writing career. MWE3: Any future album plans or you mentioned a possible tour. DT: I will always be recording. (laughter) I cannot be stopped from recording. The first show, were going to be doing South By Southwest. Were in rehearsals for that right now and then its kind of a wait and see where we wanna go and what were gonna do. And there is some discussion about a live record. MWE3: I also enjoyed your Have A Twilley Christmas CD Ep. Especially the song Christmas With The Martians. DT: Its an Ep that was released this past holiday season, but next year itll be the full album, which weve completed. Its a ten song package. The concept behind it is, we were really trying to make a, I dont know if you know this from listening to the Ep, is we were trying to make every Christmas song a different kind of Christmas song. Christmas Stars was like a folk-y type thing, and then you had your Rockabilly Christmas Ball, then you have your full-on novelty Christmas With The Martians, your dreamy ballad and your rock and roll song. And then you had your kind of 40s children, Santa Claus Favorite Christmas. So we finished it off, we did a dance track called The Santa Claus Walk, a Christmas lullaby. Kind of a Spector / Brian Wilson meets John Lennon track called Snowman Magic. So we think its going to be a nice little package for next year. We were really quite pleased with the response. MWE3: Some of the Christmas Ep tracks sound like they could have been on the 47 Moons album. DT: Right, well weve done quite a bit of work in this last time period, so its almost like weve actually recorded two albums. Cause weve done the 47 Moons plus the full Christmas album. MWE3: So when are you going to get a Grammy? DT: Whats that? I dont know...(laughter) Im hoping that it will get out there in the world enough at least for people to be aware of it. MWE3: So you like Tulsa more than living out in L.A.? DT: Oh, absolutely. Ive done so much more work since Ive been here. It took an earthquake to get me out of L.A. It turned out to be the best thing that ever happened to me. There are a lot of great players here too. MWE3: I remember the tall trees of Oklahoma. DT: Yeah, the gorgeous big leaf trees, rolling hills. Its beautiful. MWE3: Thanks for all the great music over the years. MWE3: Bill, could you say something about making 47 Moons with Dwight. He calls it a sonic leap forward. Could you say something about recording and tracking the guitars on the album and maybe one or two of your favorite songs or guitar parts from 47 Moons? BPIV: As you probably know this CD was recorded on a MAC with pro tools which means more tracks are available than in most studios. This gave Dwight and me the advantage of splitting guitar parts up into different parts so we could put them down quicker and easier than in the past. In most cases I was hearing unfinished material for the first time when I arrived at the session and really never heard it again because at each session we worked on different songs and parts. We are preparing an arrangement for "You Better Watch Out" for the live show so I actually heard that one and it sounds pretty good to me. MWE3: Could you say something about the guitars and amps you featured on the CD? 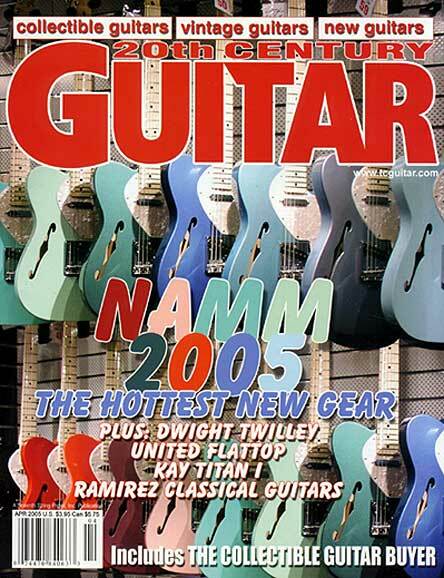 How about your favorite guitars through the years? BPIV: The only guitar I used on this CD was my G&L Broadcaster which is the only electric guitar I have played since the mid 80's when I bought it. It's easy to carry and fits my hand well. The Broadcaster is capable of producing a good variety of sounds. My amp is a Music Man HD 130, two 12" speakers, 130 watts two channels pretty much the same as a Fender Twin, which is what Dwight uses. Sometimes I used Dwight's amp when we didn't want to unload mine. I also use a Roland GR-1 guitar synth which makes all kinds of instruments such as keyboards and strings and horns and other noises. Over the years I have used lots of different guitars. 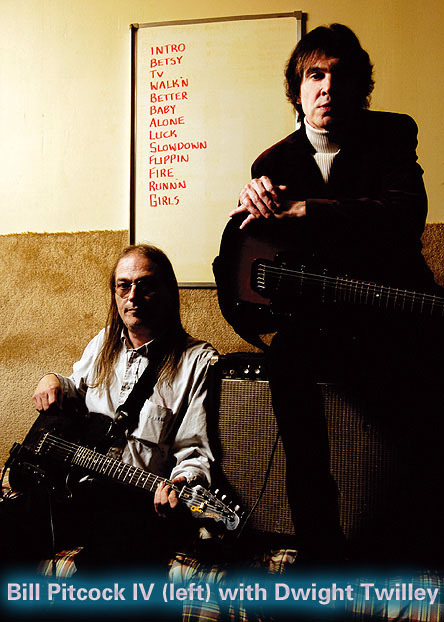 For a long time I played a '67 Fender Telecaster and a Rickenbacker mono hollow body 12 string. Then for about ten years in the late 70's I play a Gibson 335 and then I got the Broadcaster. I also play a Gibson acoustic which has no name and is only identified as model 404 number 9. I bought it when I was 19 and have used it for acoustic playing ever since. MWE3: Could you say something about your musical and guitar background and working with Dwight all these years and how you think it has influenced your guitar playing? BPIV: I was born into a musical family so when I began playing guitar I studied privately with professional musicians from the big band jazz era so I learned relatively quickly about how music worked as far as basic theory and chord progressions and so on. So I progressed into rock bands and acid rock trios and and so on until I was a senior in high school and was working in a band with Phil Seymour, who introduced me to his friend Dwight and the rest as they say is history. Through working with Dwight over the years I have had a lot of opportunities to go places and meet people which of course has been primarily on a sound stage or in a studio. Work at that level is different than any normal performing situation. Studio work demands technique and imagination in order to create and record the arrangements. Of course when all else fails we have been known to make it up as we go along.